Forest Fest Bluegrass Festival Jefferson Memorial Forest May 18th | Joe Hayden Real Estate Team - Your Real Estate Experts! The exciting bluegrass music festival, Forest Fest 2013, will be held at Jefferson Memorial Forest on 12304 Holsclaw Hill Road this Friday, May 18th. The forest will be echoing the sounds of traditional bluegrass music from 11:00 a.m. until 7:00 p.m. This is a free event, but location parking is $10 per vehicle, so save gas and ride together. The Forest Fest is about more than just fabulous bluegrass music, it is also about Kentucky traditions. The festival will feature an abundance of booths featuring local artists and handcrafted items. There will be handmade jewelry, wood carvings, art, crafts, clothing, handbags and more. Good music can work up a good appetite so there will be plenty of delicious food available for purchase to tempt your taste buds. 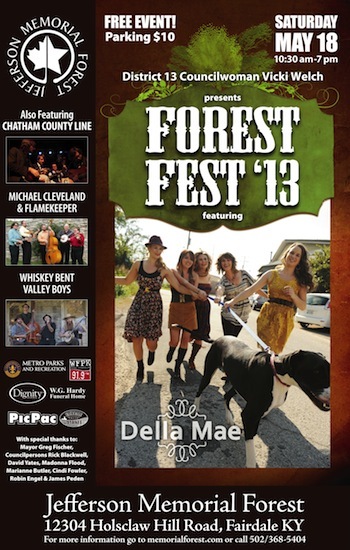 The Forest Fest 2013 bluegrass music festival on Friday, May 18th is a fun for the whole family event, plus at $10 a carload, the more the merrier!